From mildly uncomfortable to completely unbearable, constipation and bloating can be damaging to your overall health. Fortunately, there are several ways to manage these symptoms. Read on to learn about five habits that you should quit to get on the way to a healthier internal system and a better quality of life. Waking up is hard to do - but for those dealing with bloating and constipation, a cup of coffee is not recommended. Caffeine is known to over-stimulate the digestive tract, which causes gases to build up above the normal amount. Especially for women going through menopause, coffee can do more harm than good for your health. 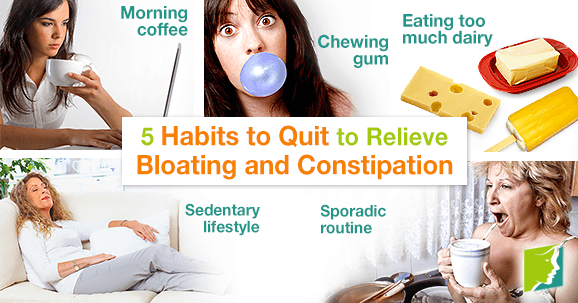 Bloating and constipation can, interestingly, also come from nervous habits like chewing gum. The constant chewing can cause you to swallow air, which builds up in the stomach and intestines. Gum furthermore contains high levels of fructose and sorbitol, two forms of sugar that can particularly worsen bloating sensation. Normally, the bloating and constipation associated with consuming too much dairy has to do with lactose intolerance. Even those without this condition, however, may experience excess gas, cramps, and bloating as a result of eating butter, cheese, or ice cream, and some people may develop lactose intolerance later in life. One of the best ways to curb bloating and constipation is physical activity. Conversely, one of the surest ways to retain such conditions is to remain largely sedentary, since inactivity decreases blood flow. Sedentary lifestyles can also lead to weight gain and increase your risk for heart disease, diabetes, and some types of cancer. Experts recommend 30 - 40 minutes of movement daily for overall health. Sometimes things come up that make it difficult to keep a normal schedule, but a sporadic routine can greatly contribute to bloating and constipation. Heavy travel or changes to sleep-wake cycles throw off the regular, rhythmic contractions of digestions, which is as much a part of one's “internal clock” and other bodily functions. Maintaining a regular pattern may remedy the problem. Bloating and constipation are undoubtedly uncomfortable, but knowing that treatment is within reach can give many sufferers the inspiration to eliminate causal habits from their lives. Follow one or more of the suggestions above to see for yourself how simple it can be to start feeling better again.